I bought this book because I really had little to no idea who this guy was. I knew he was involved in the Cuban revolution, and that his face adorns thousands of T-shirts around the world, but that was it. What really motivated me to finally sit down and read this book was something I saw in a Chinese restaurant about two or three months ago. I was sitting in the restaurant, waiting for my food when a twelve-year-old kid came in, wearing a Che Guevara shirt. I wondered if the kid even knew anything about the history or what that shirt entails. Was it simply a cool symbol of rebellion to him, as it is to thousands of others? To me, a kid wearing that shirt seemed rude, somehow. Ignorant. But these judgements I gave so easily only made me a hypocrite; I had no real knowledge myself. Jon Lee Anderson's opus takes us on Che Guevara's adventurous life from birth up until his death in the Bolivian mountains. Exhaustively researched, the timeline is flawless, from what I can tell. 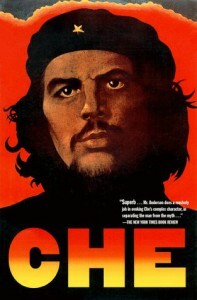 But what makes this book, and Che's life, so interesting, is the man himself: Che Guevara. As a Capitalist Imperialist myself, an individual Che would have enjoyed shooting, I never thought I'd admire a communist. But there is a lot to admire in Che. Up until his death, he was a man who stood by his word. He walked the walk and talked the talk. If he was going to be a communist in a role of leadership, he wasn't about to abuse that power and live in a palace. He lived amongst the people, and expected no less from others in positions of power. There was also a lot to hate. Che was a man bent on using violence to create social change within the world. Although this theory may hold some truth, in my opinion, the things Che wanted to accomplish in his lifetime were just insane. I'm thinking, for those who've read this work, his goal of many Vietnam-like wars, of personally provoking World War III, and his want of a global Marxist/communist government, thereby eradicating democracy, or capitalist imperialism. I live in country where I'm allowed to read what I want, and think for myself, so I'm glad these things never came to pass. My country's politics are very flawed, but so is communism, in my humble opinion. It is also my opinion that there's no government that can operate perfectly, but that is another topic. Che was, however, loved by many people. His very presence in history was enough to spark even my own affection, as he was a rare and most interesting individual. I highly recommend reading this, especially to those who've either worn the shirt, or have wanted to, but know nothing about the actual man. And remember, it is much a more attractive character trait to educate yourself before making judgements.